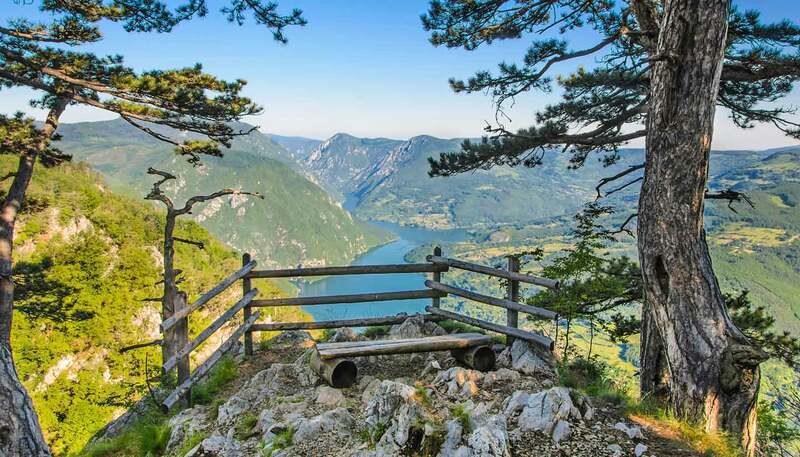 Although its reputation took a hammering during the disastrous collapse of Yugoslavia in the 1990s, Serbia has since become one of Eastern Europe’s most entertaining destinations. Much of that is down to Belgrade, which, despite NATO bombing during the Milosevic regime, has emerged as a dynamic, edgy city with an appetite for hedonism. Home to numerous excellent museums and galleries, a wide range of restaurants and cafés, and some of the best nightlife in southeast Europe, Belgrade is drawing comparisons with some of the world’s coolest cities. It is also helping lead the rest of the country into a bright and hopeful future, with a young generation of creative and outward-looking Serbs reshaping the historic land that was founded as a principality some 1,200 years ago. Away from the capital, Novi Sad is an attractive, lively city with an elegant centre and picturesque fortress overlooking over the Danube. In the far north, Subotica has an array of secessionist architecture and a notable Hungarian character. The province of Vojvodina, north of Belgrade, has some excellent wetland habitats that are home to numerous bird species, while south of the capital the countryside consists of lush, wooded valleys with hidden-away Orthodox monasteries. Scattered among the country's more mountainous regions are a number of vast national parks. Serbia is known for the forthright character of its citizens; its resilient culture has survived numerous occupiers and foreign rulers over the centuries. Despite their formidable reputation, visitors will find Serbs to be passionate but welcoming. As an Orthodox Christian country, it remains to a large degree deeply religious, though this fact is belied somewhat by the hedonism found in its bigger cities. While there are still some political problems in Serbia, which has yet to formally recognise Kosovo after it unilaterally declared independence in 2008, the country has turned a corner. It is officially a EU candidate and many Serbs are hopeful of the change in economic fortunes that might be brought by becoming a full member. 77,474 sq km (35,246 sq miles). President Aleksandar Vucic since June 2017. Prime Minister Ana Brnabic since June 2017. Most visits to Serbia are trouble-free. Weekly protests are currently taking place in Belgrade and some other towns and cities. These usually remain peaceful, but can cause significant disruption, including to public transport. Large gatherings have been announced for 11 and 12 April in Novi Sad and 13 and 19 April in Belgrade. You should keep up to date with local developments and avoid any large crowds or demonstrations. You may have difficulty entering Serbia if you have a Republic of Kosovo stamp in your passport. Terrorist attacks in Serbia can’t be ruled out. If you need to contact the emergency services, call 912 (police), 913 (ambulance), 914 (fire) or 112 for the all purpose emergency number. Take sensible precautions to protect yourself from street crime, particularly in larger cities. Some sporting events have had incidents of violence and petty crime, you should remain vigilant and follow the advice of the local authorities. Watch out for pick pockets in tourist areas and at airports, on public transport and petrol stations on the motorway. Pay attention to personal safety late at night, and when leaving nightclubs. Carry a mobile phone in case you need to contact the emergency services. As a foreigner, you may be a target for criminals who may assume you are carrying large amounts of cash. Four wheel drive and luxury vehicles are also popular targets. Isolated incidents of armed violence in major cities are usually linked to organised crime and not directed against foreigners. Report all incidents of crime to the local police and get a report. There is still some danger from residual mines and other unexploded ordnance left over from the 1999 conflict in Kosovo and in Serbia. Most of the affected areas are in the mountainous regions to the north and east of Kosovo. Take special care in these areas and keep to marked roads. Most of the remaining dangerous zones are covered with dense vegetation. If you see anything suspicious, don’t touch it, but report it immediately to the police. You can drive in Serbia with a valid UK driving licence or International Driving Permit on short visits for up to a year from the date of first entry, or for a single stay of up to 6 months. If you’re staying longer than 6 months you will need to get a local licence. The British Embassy is aware of the policy by the Serbian authorities to retain UK driving licences when applying for a Serbian driving licence. The Serbian Ministry of Interior sends the UK driving licence to the British Embassy who are obliged to return them to the DVLA in the UK. You may obtain further information about Serbian driving licences at the local police station where you registered. You cannot exchange an International Driving Permit for a Serbian licence. If you’re bringing a vehicle into Serbia, you must have vehicle registration and ownership documents and a locally valid insurance policy. European green card vehicle insurance is now valid in Serbia, but the requirement to hold a green card is no longer in effect. You should confirm with your insurance company that your policy covers Serbia. Contact the Serbian Embassy in London if you have more detailed questions about bringing a vehicle in to the country. The British Embassy is unable to offer any assistance to individuals attempting to bring vehicles into Serbia who do not have the correct documentation on arrival at the border. Many Serbian car hire firms will not allow their vehicles to be driven in Kosovo, Albania or Bulgaria due to concerns about the security situation. There have been some incidents where Serbian registered cars have been targeted in more isolated areas of Kosovo. The general standard of roads in Serbia varies from fair to poor. Roads are worse in rural areas, especially after bad weather. One particularly dangerous road is the Ibarska Magistrala (linking Belgrade, via Čačak and Užice, to Montenegro). You are required by law to wear a seatbelt. You must drive with dipped headlights on during the day. You must not use a mobile phone whilst driving. There are several toll booths along motorways. Individual toll charges vary from 2 - 10 Euros for cars. Foreign registered vehicles pay the same toll as those registered locally. Much of the public transport is old and overcrowded although there have been improvements in the major cities. When using taxis, you should only use those which are officially registered - look for a municipal registration number in addition to the cab number. Alternatively, call one of the radio taxi phone numbers (most operators speak English) with your street location. For further information on using public transport and general driving conditions see the website of the Belgrade Tourism Organisation. See the AA and RAC guides on driving in Serbia. Trains can be slow, particularly in winter when there are often long delays. On overnight trains, sleeping berths can be locked. Each carriage has an attendant. Local police carry out random ID checks onboard trains in Serbia. Thieves operate on trains, so take particular care that documents and other valuables are safe. Weekly protests are currently taking place in Belgrade and some other towns and cities. Generally, most protests remain peaceful, but they can occasionally turn violent, especially where there is a potential for far-right infiltration or hooliganism. Protests can also lead to significant disruption, including to public transport. Large gatherings have been announced for 11 and 12 April in Novi Sad and 13 and 19 April in Belgrade. Keep up to date with local developments and avoid any large crowds and demonstrations. Terrorist attacks in Serbia can’t be ruled out. Attacks could be indiscriminate, including in places visited by foreigners. Terrorists may target religious sites, including churches. Possession or trafficking of drugs attract strict penalties and usually a lengthy prison sentence. There are no laws against homosexual activity in Serbia. There is anti-discrimination legislation, with limited implementation in place. The Pride Parade has taken place without incident over the last few years. There are gay friendly hostels, clubs and other events in Belgrade. However, you should be aware that the level of public prejudice against homosexuality and the LGBT population is still relatively high and public displays of affection may attract negative attention. See our information and advice page for the LGBT community before you travel. Taking photographs of military/police installations, personnel or vehicles anywhere in Serbia may lead to difficulties with the authorities. British passport holders don’t need a visa to visit Serbia for up to 90 days. For further information on entry and exit requirements, contact the Serbian Embassy in London. If you wish to extend your stay in Serbia you will need to apply for temporary residence status at least 30 days before the 90 day period expires at the police station where you’re registered. For more information visit the website of the Serbian Ministry of Foreign Affairs. When you enter Serbia, make sure you get an entry stamp in your passport. Temporary residents should have an exit-entry visa as well as a residence stamp. If you try to leave Serbia without an entry stamp or exit-entry visa you may face charges of illegal immigration, a heavy fine and possible imprisonment. You should only enter Serbia through recognised border crossings. The authorities in Serbia don’t consider the designated crossing points with Kosovo to be official ‘international’ border crossing points. Foreign nationals have been denied entry to Serbia if they have Republic of Kosovo stamps in their passports. You’re less likely to experience problems if you travel into Kosovo from Serbia and return via the same route, or if you travel via Albania, Macedonia or Montenegro. For more information visit the website of the Serbian Ministry of Foreign Affairs. It’s a legal requirement that you register with the local police in the town/city where you’re staying within 24 hours of your arrival in Serbia, unless you’re staying in a hotel where you will be registered automatically on checking-in. If you don’t register you could be fined, detained or face a court appearance. You will be required to declare money (including travellers’ cheques) in excess of €10,000 (or equivalent in other currencies) that you bring into Serbia. Customs officers hold declaration forms and will require a receipt of purchase for Dinars bought from a foreign bank. On departure, you will need to return a certified copy of this declaration to customs so that money (up to the amount brought in but not exceeding €10,000 in value) can be taken out again. If you fail to comply with these rules, your money may be confiscated. In order to avoid customs charges, you will be required to declare items of value (eg jewellery, photographic and computing equipment) that you are temporarily bringing into Serbia. For more information on declaration of money and the importation of goods see the Serbian Ministry for Foreign Affairs or the National Tourism Organisation of Serbia. UK Emergency Travel Documents are accepted for entry, airside transit and exit from Serbia and as valid ID documents in Serbia. However, they should be valid for not less than 7 days and no more than 6 months. There is a reciprocal healthcare agreement for British nationals visiting Serbia, which entitles you to free treatment for genuine emergencies. You’ll need to present a British passport, evidence of registration with the local police (if you’re not staying in a hotel) and a certificate confirming entitlement to benefit under the UK Social Security Acts. You can get this certificate from HM Revenue & Customs. The health system in all parts of Serbia is suffering from widespread shortage of medicines and other essentials. For non-emergency treatment, or treatment that isn’t covered under reciprocal arrangements, payment in cash is normally required. Make sure you have adequate travel health insurance and accessible funds to cover the cost of any medical treatment abroad and repatriation. Since October 2017 there have been more than 3,000 cases of measles in Serbia and around 10 deaths from complications. The National Travel Health Network and Centre (NaTHNaC) advise anyone travelling abroad to make sure they’re up to date with routine vaccination courses and boosters as recommended in the UK, including the measles-mumps-rubella (MMR) vaccine. Over 100 cases of the West Nile virus have been reported in Serbia, (around half in Belgrade), with about a dozen fatalities. You should take adequate precautions to avoid being bitten by mosquitoes. If you need emergency medical assistance during your trip, dial 194 and ask for an ambulance. You should contact your insurance/medical assistance company promptly if you are referred to a medical facility for treatment. For general medical information in Serbia, visit the website of the Serbian Ministry of Health, or for Belgrade specific information visit the City of Belgrade website. During especially hot and dry periods there is a danger of forest fires. Take care when visiting or driving through woodland areas. Make sure cigarette ends are properly extinguished, and don’t light barbecues. Serbia lies in a seismically active zone, and earth tremors are common. Serious earthquakes are less frequent but do occur. To learn more about what to do before, during and after an earthquake, visit the website of the US Federal Emergency Management Agency. Parts of Serbia are prone to flooding following extremely heavy rain, as occurred in May 2014. Details of flood warnings are available via the Serbian hydro-meteorological institute website. In the event of floods affecting your area, you should follow the instructions of the Serbian authorities. The official currency of Serbia is the Dinar. Credit cards are accepted in most hotels and shops, and nearly all ATMs accept international bank cards. Currency exchange in Belgrade (including at Belgrade Airport) accept Sterling, US Dollars and Euros. British banks don’t generally exchange Dinars. You should exchange any unwanted Dinars before you leave Serbia. You should only change money through banks or official exchange offices and not through street dealers. You will be unable to exchange Scottish and Northern Irish bank notes in Serbia.